The ATA8520E is a Transceiver IC for up- and downlink operation in the EU (ETSI) 868MHz and US (FCC) 902MHz SIGFOX networks. It can be used to provide equipment for the Internet of Things (IoT) and other machine-to-machine communication using an air interface to the SIGFOX proprietary network. Industrial and consumer applications include environmental sensors, smart meters, patient monitors, home automation and building security systems. 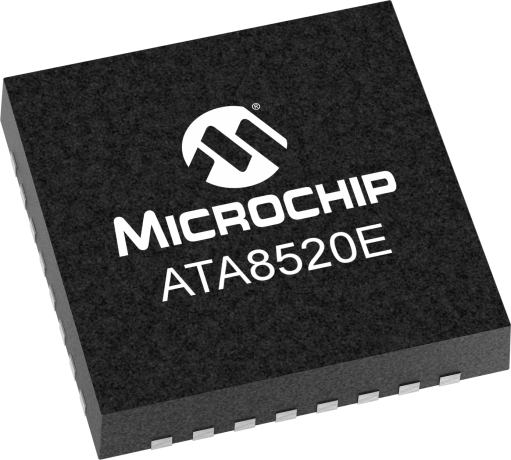 The ATA8520E incorporates an RF front end for up- and downlink to a SIGFOX base station, a digital baseband and a microcontroller in a single chip. Firmware stored in internal memory supports the chips operations, including handling of the SIGFOX protocol. The SIGFOX ID, PAC code and Encryption key are stored and secured inside the chip. A serial peripheral interface provides for external control and configuration. The single chip solution provide extreme low power consumption. The Supply-voltage range is 2.9V-3.1V (3V operation mode) or 3.3V-5.5V (5V operation mode).